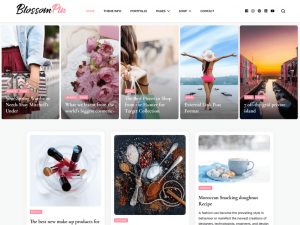 Blossom Pin is a free feminine and chic WordPress blog theme to create stunning, lively and eye-catching websites. You can easily customize your website using the typography and color features. The beautifully placed Instagram section can be used to show your Instagram account and increase your followers. The well placed Newsletter section will help you to grow your email list and keep in touch with your visitors. Blossom Pin is mobile friendly and fully responsive to ensure your website looks great on different sized devices. Blossom Pin is Schema friendly, SEO friendly, and speed optimized. The theme is translation ready and supports RTL and WooCommerce plugin for your utmost benefit. In addition, Blossom Pin is backed by world-class, one-on-one support, and a super active team of developers and designers ready to help!